While only 20% of Americans say they feel overloaded by the amount of information they encounter in modern life, many are open to getting some help in finding material that can help them make decisions. 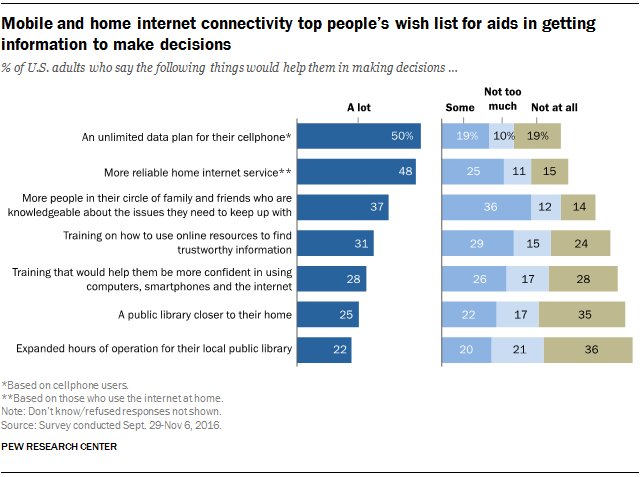 A new analysis of a November 2016 Pew Research Center survey shows that 76% of U.S. adults say they would benefit “a lot” from having at least one of seven different kinds of help in accessing information that can help them make decisions. (See chart below for full list.) About four-in-ten (41%) say three or more of these possible forms of assistance would help them a lot. Americans are especially likely to say they would benefit from improvements in the services they use to go online. Seven-in-ten cellphone users (70%) say they would benefit from an unlimited data plan, with 50% saying they would benefit a lot. And nearly three-quarters of home internet users (72%) say having more reliable service would help them gather information for decisions, with 48% saying it would help them a lot. There are notable differences by race and ethnicity. Among cellphone owners, 79% of Hispanics and 77% of blacks say unlimited data plans would be at least somewhat helpful, compared with 67% of whites. And among home internet users, 82% of Hispanics and 81% of blacks say more reliable home internet service would be at least somewhat helpful, compared with 68% of whites. More than half of adults say that training in the digital realm would help them when it comes to accessing information that can aid in making decisions. Around six-in-ten (61%) say they would like training on how to use online resources to find trustworthy information, while 55% would like training that can build confidence in using computers, smartphones and the internet. Again, there are differences in the views of whites and minorities on these questions. While 75% of Hispanics and 70% of blacks would like training on how to use online resources to find trustworthy information, the same is true for 55% of whites. Three-quarters of Hispanics and 66% of blacks would like training on using computers, smartphones and the internet, compared with 48% of whites. There are smaller, yet still significant, gaps when looking at education. Those with a high school diploma or less are more likely to want training in both areas than those who have graduated from college. Americans are somewhat less likely to say they would benefit from turning to libraries when it comes to accessing information that can help them make decisions. Some 47% and 43%, respectively, say having a library nearby or one with longer hours would help in this regard. However, there are large differences about the value of libraries by race and educational attainment. By nearly two-to-one, blacks and Hispanics are more likely than whites to see benefits in having a library nearby or having better library hours. Americans with a high school diploma or less are also more likely than those with a college degree or more to see these benefits. The role of close family and friends is also important in guiding people to information that can assist in decision-making. Nearly three-quarters (74%) say having more people in their social circles with knowledge of key issues would help at least somewhat in decision-making, with 37% saying this would help a lot.